Custom iPhone and iPad app development. 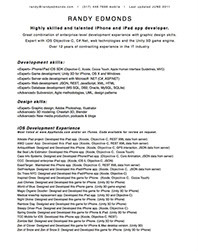 iPhone and iPad custom app developer. iOS business and interactive developer with enterprise-level development experience and graphic design skills. Expert with the iPhone iOS SDK, C#.Net development, Web technologies and the Unity 3D game engine. Over 15 years of experience in the IT industry.